The indoor-outdoor trend over recent years has brought with it a wealth of greens in interiors with houseplants bringing a soothing sense of grounding. Now that spring is here and we are starting to see the luscious greens appear outside we are reminded of how refreshing they can be. Greens have been known to have healing qualities, and blues with their naturally calming effect can create a feeling of serenity, but using the two together can be tricky. Here are a few examples of some projects we've worked on where blues and greens have taken centre stage, with beautiful results. This 10 Drop Pear Drop Chandelier mixes cool shades of Steel Blue and Teal with a more muted shade of Smoked Olive, adding a warmth to the combination and picking up the softer tones of beiges and greys in the room. See more images from this beautiful projecthere. The stunning Victoria Terrace Lounge at the Grand Hotel in Brighton used Stemmed Roundswith Turkish Blue and Yellow Ochre to compliment their emerald and forest green chairs. The touches of warm yellow help to round off the cool shades and the deep blue of the stems balance out the rich greens so that neither colour dominates the other. 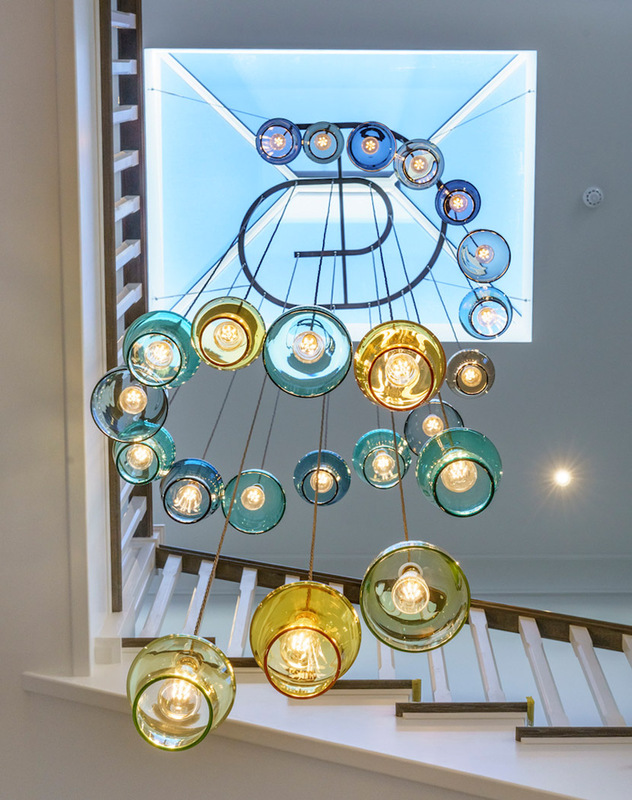 Steel Blue hangs next to Yellow Ochre, Teal and Smoked Olive in this 23 drop stairwell chandelier from our New Forest project. Warm yellow shades balance out the palette with the pendants forming a gradient from cool indigos and blues at the top, to warmer blues, greens, and yellows at the bottom. These projects show a few of the blues and greens options we have available, but to see our full range click here. 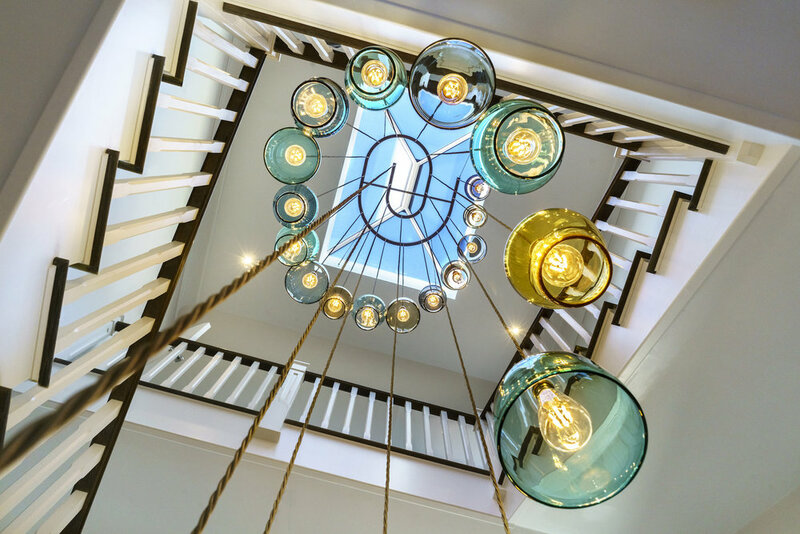 For more inspiration on how you can use our lights to add colour to your space this season, take a look at our gallery or projects page.